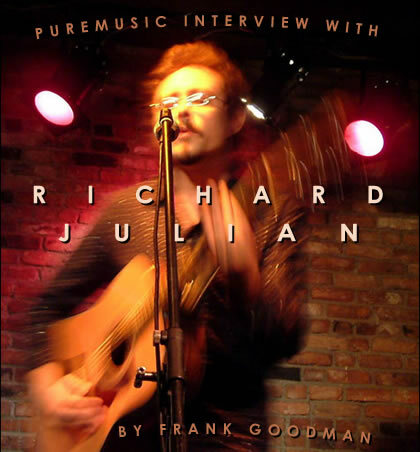 To get started talking about Richard Julian, I just have to put his music on. "Cold Grey Sky." He's got everything I want to hear, going on. One line makes you want to laugh, the next one makes you want to break right down and cry. They're just not as far apart as they used to be. "I thought she asked me for the world once, all she wanted was some comfort and nothing more..."
Met him first a few years back with a good friend of mine he was dating at the time, at the Folk Alliance in Jacksonville. He's got a really kooky look around the eyes that's a little hard to get a bead on at first. He's no glad hander, and he's not from the country. This friend of mine had a way of dating really good songwriters, so I made a note of where Richard was playing the next day or two. When I caught up with a show that afternoon, I noticed a number of sharp writers there. He knocked me out so fast I didn't know what hit me. And then song after song he made it clear that he had a whole trunk full of that. He played his axe really well, but only as the song required, no special anything. No tunings, half capos, no props. He used some chords outside the folk syllabus, but he knew how to do it. He blew everything else I saw that weekend away, solo. But it got better from there, as time went on. I really liked Smash Palace, the CD he gave me, but the next one, Good Life, literally showed me what I was looking for. He was on board with producer Brad Jones, whose records were among my faves, as was his stable of players. But Jones would be the first to tell you that if you don't have a great song, you don't have anything, really. And Julian's songs are just better made than most anything I can find, for my taste. They're funny in the best ways, ways that keep me laughing in the same spots for years, even when you know what's coming. And his timing and his delivery, funny or sad, is always inspired. One night I saw him perform in NYC and he started rambling a little bit, and he chided himself "awesome patter, Richard." Funny how moments like that will stay with you. He and Norah Jones have a Country band called The Little Willies that will come out with an album soon, and we'll see if we can round the both of them up for a conversation on that subject at release time. We talk some about that and many other things in the friendly exchange coming up. I can't say enough about this guy, so I'll just ask the questions from this point on. Richard Julian is the man. Period. End of story.